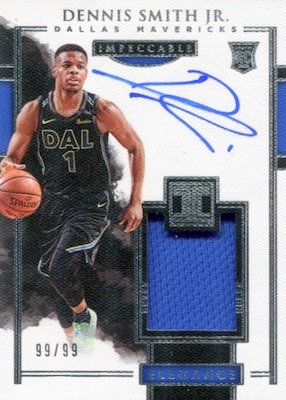 The '17-18 NBA collecting season (and deep rookie class) forges ahead, seemingly with no end in sight, via 2017-18 Panini Impeccable Basketball. 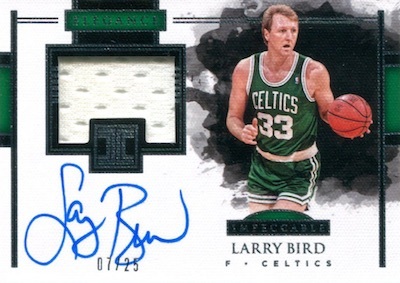 Like in the 2016-17 debut, the attractive cards come with a hefty price tag, averaging five autographs per box. New this year, there is one metal insert in every box. Joining the premium base set, 2017-18 Panini Impeccable Basketball offers all-new Stainless Stars (#/99 or less) cards which are printed on metal stock. Signed metal cards are an option, as well. The Stainless Steel cards combine with the familiar and rare NBA Logo cards, featuring one troy ounce of Silver (#/16) or one-half troy ounce of Gold (#/10), to drop at a rate of one per box. 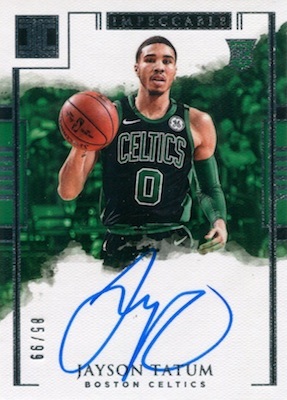 Other than the base and metal inserts, the 2017-18 Panini Impeccable Basketball checklist is all about NBA signatures, which average five per box. One choice is the Rookie Autographs (#/99) subset for 20 first-year stars. The Elegance auto relic line is home to both top rookies and veterans. These have low-numbered Holo Silver (#/25 or less), Holo Gold (#/10) and Platinum (1/1) patch parallels. Reaching directly into a player's past, the Impeccable Victory Signatures insert recalls a notable performance for a star that led to a win. There are also several themed autograph inserts that highlight player-specific details, like Impeccable All-Star Appearances, Draft Picks and Numbers. These are serial numbered to the stat or detail being referenced. 2017-18 Panini Impeccable Lonzo Ball Rookie On Card Auto RC Lakers 1 10!! Shop available 2017-18 Impeccable NBA autographs on eBay. PARALLEL CARDS: Holo Silver #/49, Holo Gold #/10, Platinum 1/1. PARALLEL CARDS: Holo Gold #/10 (No Laettner*), Platinum 1/1. PARALLEL CARDS: Holo Gold #/10, Platinum 1/1 (No Griffin*). 24 cards. Serial numbered #/49. 100 cards. Serial numbered #/16. View the full 2017-18 Panini Impeccable Basketball checklist spreadsheet. The day of release and still no checklist. Crazy. Panini is the worst sometimes. I saw a Felipe Lopez redemption pulled in a break. For a product this pricey why would players like Felipe Lopez be in it? Looks Like a nice product, beautifully designed cards. also the Stainless steel autos are missing from the checklist. The Stainless Steel autographs are listed at the bottom of the autograph checklist just above the metal inserts.